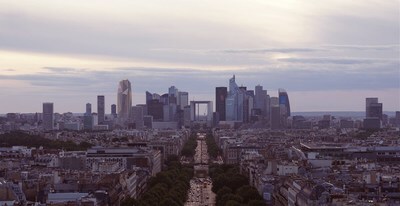 - The Paris district "La Defense" will become home to a spectacular new skyscraper, featuring thyssenkrupp's unique TWIN elevators with two cabins instead of just one moving in the same shaft. thyssenkrupp Elevator will deliver twelve TWIN elevators, a technology that frees up floor space while increasing passenger transport. (Photo: https://mma.prnewswire.com/media/806766/thyssenkrupp_TWIN_elevators.jpg ) Hekla Tower with its 66,000 sqm of office space will become an iconic feature in the redesign of the district - including a green footpath modelled on the famous High Line in New York City.